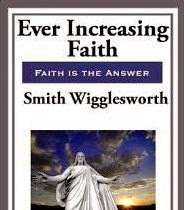 Smith Wigglesworth was one of the most important evangelists in the early history of Pentecostalism. He traveled the world teaching faith and bringing healing to thousands, even raising the dead. This book is a collection of some of his sermons which were transcribed. He teaches on the gifts of the Holy Spirit such as prophecy, divine healing, the gift of tongues, word of knowledge, and discerning of spirits. This book is a true Christian classic, and also includes a short biography. For author Smith Wigglesworth, life was a continual adventure. Always trusting God, even in the most hopeless situations, he had total confidence in the power of Christ. Join this late evangelist in the great adventure called "faith," where miracles were daily events. Witness the many accounts of deliverance from diabetes, tuberculosis, demon possession, and even death. Prepare to be overwhelmed as the seed of faith begins to expand and grow in your heart. Watch as God moves, touching lives with healing and deliverance––miracles that follow as signs of the power of faith.